SGM Colony counters are designed for quick and accurate counting of bacterial and mould colonies in petri dishes. Feature packed & easy to use, this is an indispensable bench top tool for the busy microbiologist. More recent counters attempt to count the colonies electronically, by identifying individual areas of dark and light according to automatic or user-set thresholds, and counting the resulting contrasting spots. The maximum number of colonies which may be effectively counted on a single plate is somewhere between 100 and 1,000, depending on the size of the colony and the type of organism. This model is fitted with automatic 3 digits L.E.D. Digital Display. It minimize the strain of counting. Each touch of Marking Pencil on the Petridish increments the colony count by '1' and the glowing L.E.D. 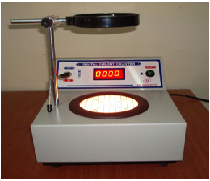 Digital Display depicts the total colony count, thus relieving the technician from the tedious task of counting and eliminating the chances of error. Maximum colony count possible up to 9999.Provided with a manual RESET of digital display. ON/OFF switch, counting pencil, cord and plug. Suitable to work on 220 V, single phase, 50 Hz, AC supply. 1. 110 mm dia. magnifying Glass. 2. Audible Confirmation of Each Count. 3. Uniform Glare Free Illumination. 4. Digital readout from 0 - 9999. 6. Wolffhuegel Glass Grid without Focusing Facility. 7. Automatic retaining of last value in case of power failure.